As these are linear amplifiers the output has a direct relation to the input, so with a 4w input the RM and ZG amps will only produce around 40w. The EA-150P is also rated as having a 100w maximum output (on FM) but only needs a 5w input to produce that, so a 4w input will give you 80-90w output! The EA-150P can be used on SSB but input power should be limited to 8w... If using a modern legal SSB-capable CB radio, and have a power readings facility on your SWR meter, you can use the Mic Gain control to reduce power whilst whistling a constant tone into the mic to produce a steady power reading. On SSB, at 8w input, the amplifier will give a healthy 180w PEP output. It's worth bearing in mind that on FM, the receive amplifier doesn't know the difference between wanted signals and background noise, so although signals will be stronger, the actual signal to noise ratio is largely unchanged. (Example : without preamp you may be receiving a signal at S7 with a background noise of S3, switch the preamp on and the wanted signal increases to S9 but so does the background noise, to S5). AM and SSB are where the receive amplifier is more useful as the signal to noise ratio is increased more favourably on these modes. Buyers outside Europe should Contact Us first. CONSTANT POWER SUPPLY : This amplifier must have power to it all the time it is in line - if you don't want it on just use the on/off switch, but if it is in line it MUST have power to it otherwise the relay will close when the power feed is removed and the transmit power from your CB will not be allowed through, causing damage to both the CB and amplifier. We recommend direct connection to the battery (you can buy extra power cable here) because of this, but also because any voltage drop relates directly in slightly less power output from the amp. AM/SSB SWITCH : This switch should be kept on AM if you are transmitting on AM or FM. The SSB setting is for another mode of transmission where there is not a constant signal transmitted so to avoid the unit constantly switching between receive and transmit with every word, a short delay is introduced, so if you inadvertently put this switch to SSB when on AM or FM the only thing that will happen is that when you finish transmitting there will be a second or so delay before the unit switches over and allows signals to be received. 90W IS THE MAXIMUM YOU CAN GET FROM ANY AMP WITH 4W DRIVE : This is about the highest output you can get from any amplifier when connected to a legal cb with 4w output. There are larger amplifiers available, but these require more 'drive' from the radio, as they have more amplifying transistors. For example : This amp has one main power transistor and it is rated as giving 90w output from 4w input (most other amps of this size will only give 40-50w output from 4w input). The larger amplifiers have two or more of these transistors and may be rated at 200w or 400w output but this would be from 10w or 20w input on FM. If anyone tells you they have a 200w or 400w amp but are using it on a 4w CB the chances are they are still only getting 80-90 watts out of it!). If comparing this amplifier to others on the market, check the other units max input power on FM ... if it's 10w and has a max output on FM of 100w, you'll only get around 40w output when using it with a 4w CB - simple maths! THESE AMPLIFIERS GET HOT : The majority of the size of these amps are the heat-sink fins on the top - the job of these is to get hot as dissipate the heat into the air, and they will get pretty damn hot in use, especially with a high power amp like the EA-150P. You need to make sure that there is a free flow of air around these amps - best not to cram them into a small space. YOU NEED A LOW SWR TO USE AN AMP : One of the quickest ways to kill an amplifier like this is to run it into an antenna system that has a high swr... like the CB's we sell, the output transistor (the bit that can get damaged by a high SWR) is NOT covered by the guarantee as it's the user/installers responsibility to make sure the SWR is low - ideally below 1.5 although you can usually get away with readings upto 1.7 / 1.8 if amplified transmissions are kept short. More about SWR on our SWR explained page. BE CAREFUL WHERE YOU USE A HIGH-POWERED AMP LIKE THIS : Please do not use this amplifier is you are within 100 yards of the following : petrol pumps, police/ambulance/fire vehicles or other cb users on the same or adjacent channel to you. You may also find that this amp can set off some older domestic wireless house alarms as well as cause interference/breakthrough on televisions and radios - maybe best switched off when driving through a housing estate for example... leave the amp for the countryside! 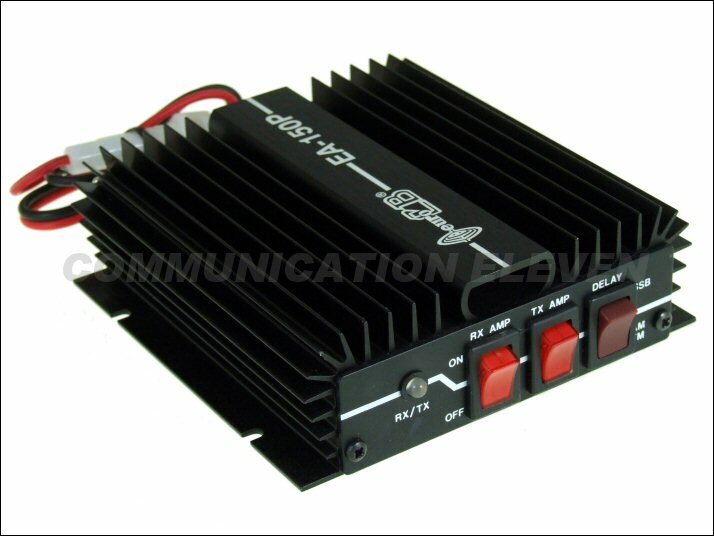 AMPLIFIERS ARE ILLEGAL : Remember Amplifiers like this are illegal to use on CB Radio. A lot of people do use them, and prosecutions are extremely rare and even then only when serious interference or abuse has occurred, but please be mindful of their illegality. If someone is receiving you at signal 5 when you are using 4w, they'd get you at signal 5.5 with 8w, signal 6 with 16w, signal 6.5 with 32w, signal 7 with 64w, signal 7.5 with 128w, signal 8 with 256w etc etc. So you can see that using this amplifier will give you approximately a 2.25 signal point increase - however this does rely on their signal meter being calibrated which most aren't really so the actual gains you'll see may differ slightly depending on who you're talking to. You can also see that if you were running a 250w amplifier, increasing this to 500w will only get you 0.5 signal point increase - the same as going from 4w to 8w ! !